We do not find the term “legalism” in the Bible. However, this term captures a teaching that the Bible teaches against. Believers in Christ should learn how to define, recognize, and defend against legalism in themselves and in the local church. It seems that legalism is often easier to see, than it is to define. In fact, legalism can express itself in a multitude of ways. To define it simply, legalism is an inappropriate use of rules or laws. This definition seems to fit with what Paul wrote to Timothy: “We know that the Law is good, if one uses it lawfully” (1 Tim. 1:8). It often isn’t the rules or laws that are wrong, but our application or use of them. It is the goal of this paper to explore different forms of legalism, and how to defend against it in ourselves and in the Christian community. 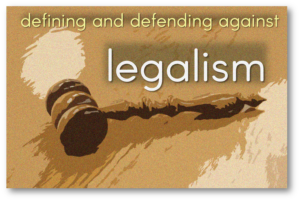 What are different forms of legalism? Gaining acceptance from God (justification). This is probably the most popular use of the term “legalism.” It is this form of legalism that made the Pharisees famous—namely, they used the law in a futile attempt to gain acceptance from God. This is an inappropriate use of the Law, because the Law was never intended to justify us. Just as an X-ray cannot fix a broken bone but only show one, so too the Law can reveal sin but never heal sin. (Gal. 2:21) I do not nullify the grace of God, for if righteousness comes through the Law, then Christ died needlessly. (Rom. 3:20) By the works of the Law no flesh will be justified in His sight; for through the Law comes the knowledge of sin. (Rom. 3:28) A man is justified by faith apart from works of the Law. Growing with God (sanctification). While some readers might find this shocking, the Bible teaches that the moral law is actually a hindrance to spiritual growth, rather than a help. To be clear, God’s moral law is objectively true and a perfect reflection of his moral nature. Believers should never deny this. Such a position is called antinomianism (“anti” “law”). However, using the Law for sanctification would be a misuse of the Law, because it was never intended to be used that way. (For a fuller explanation, see comments on Romans 7:6). Wanting approval from people. Jesus rebuked the Pharisees for following the Law so that they could gain social status or approval from men. As believers, when our motivation to serve God is based on human approval, we too have fallen into legalism (cf. Gal. 1:10). (Mt. 23:5-7) They do all their deeds to be noticed by men; 6 They love the place of honor at banquets and the chief seats in the synagogues, 7 and respectful greetings in the market places. (Jn. 5:44) How can you believe, when you receive glory from one another and you do not seek the glory that is from the one and only God? Focusing on outward appearance. A person who is truly being transformed by God will have an external change in their love for God and others. Legalism, by contrast, ignores inner transformation, and substitutes it with external adherence to rules and laws. (Mal. 1:8) When you present the blind for sacrifice, is it not evil? And when you present the lame and sick, is it not evil? Why not offer it to your governor? Ritualism and formalism. Legalism promotes ritualism to help us grow with God. But these manmade rules and rituals are worthless at best, and harmful at worst. Paul taught that these practices have no effect on spiritual growth, and these were actually harmful to the practitioner. (Col. 2:23) Such regulations indeed have an appearance of wisdom, with their self-imposed worship, their false humility and their harsh treatment of the body, but they lack any value in restraining sensual indulgence. Rules without resources. God calls us to a life of radical love. But he also gives us the resources we need to carry this out—such as the Holy Spirit, a new identity in Christ, the Bible, and the Christian community to name only a few. Legalism places laws and expectations on others without giving them the resources, help, or support that they need. (Mt. 23:4) They tie up heavy burdens and lay them on men’s shoulders, but they themselves are unwilling to move them with so much as a finger. Harmful rules. As believers, our highest ethic is always one of love, as the Bible defines that term (i.e. doing what is in the best interest of the other person). Whenever rules or laws harm the individual involved, we have lapsed into legalism. (Acts 15:10) Why do you put God to the test by placing upon the neck of the disciples a yoke which neither our fathers nor we have been able to bear? (Acts 15:28) It seemed good to the Holy Spirit and to us to lay upon you no greater burden than these essentials. (Mt. 15:6) You invalidated the word of God for the sake of your tradition. (Mt. 12:1-7) Jesus went through the grainfields on the Sabbath, and His disciples became hungry and began to pick the heads of grain and eat. 2 But when the Pharisees saw this, they said to Him, “Look, Your disciples do what is not lawful to do on a Sabbath.” 3 But He said to them, “Have you not read what David did when he became hungry, he and his companions, 4 how he entered the house of God, and they ate the consecrated bread, which was not lawful for him to eat nor for those with him, but for the priests alone? 5 “Or have you not read in the Law, that on the Sabbath the priests in the temple break the Sabbath and are innocent? 6 “But I say to you that something greater than the temple is here. 7 “But if you had known what this means, ‘I DESIRE COMPASSION, AND NOT A SACRIFICE,’ you would not have condemned the innocent. Creating non-biblical absolutes. Paul counsels us, “Do not go beyond what is written” (1 Cor. 4:6 NIV). Other passages warn against adding or subtracting from Scripture. When believers have issues of conscience regarding non-moral matters, they should not absolutize these to every believer on Planet Earth. Instead, they should hold issues of personal conscience as just that: personal and not universal. (Rev. 22:18-19) I testify to everyone who hears the words of the prophecy of this book: if anyone adds to them, God will add to him the plagues which are written in this book; and if anyone takes away from the words of the book of this prophecy, God will take away his part from the tree of life and from the holy city, which are written in this book. (Deut. 4:2) You shall not add to the word which I am commanding you, nor take away from it, that you may keep the commandments of the Lord your God which I command you. (Prov. 30:6) Do not add to His words or He will reprove you, and you will be proved a liar. Focusing on moral minutiae. We not only need to teach what the Bible teaches, but also emphasize what the Bible emphasizes. If we emphasize everything, then we are really not emphasizing anything. Imagine a student who highlights every line in his text book. If he highlights everything, he quickly discovers that he really hasn’t highlighted anything. Instead, he has just changed the color of the pages! As believers, we should prioritize what Scripture prioritizes (see “Prioritized Ethics”). (Mt. 23:23) You tithe mint and dill and cummin, and have neglected the weightier provisions of the law: justice and mercy and faithfulness; but these are the things you should have done without neglecting the others. (Mt. 23:24) You blind guides, who strain out a gnat and swallow a camel! Legalism is not SELF-DISCIPLINE. Paul writes, “Discipline yourself for the purpose of godliness” (1 Tim. 4:7). He also writes, “I run in such a way, as not without aim; I box in such a way, as not beating the air; but I discipline my body and make it my slave, so that, after I have preached to others, I myself will not be disqualified” (1 Cor. 9:26-27). Legalism is not HARD WORK. Paul encourages Timothy to “labor and strive” for Christ (1 Tim. 4:10). The Greek word here is agōnizō (“agonize”). Later, he writes, “Take pains with these things; be absorbed in them, so that your progress will be evident to all” (1 Tim. 4:15; cf. 2 Cor. 11:23; Col. 1:29). The grace of God is not antithetical to hard work. After all, Paul writes, “I labored even more than all of them, yet not I, but the grace of God with me” (1 Cor. 15:10). Legalism is not RADICAL DEDICATION TO CHRIST. What is the difference between high dedication to Christ and legalism? Some Christians see no distinction. They have no category for breaking a spiritual sweat for Christ, and view anyone who teaches this to be legalistic (see “High Dedication Ethos”). Self-imposed issues of conscience. Some believers have a more sensitive conscience than others. For instance, we’ve known some believers that have decided to give up drinking alcohol, because they don’t feel like they can drink without taking it too far. If a believer has a personal conviction about this, there’s nothing wrong with her limiting herself of this right (For more on the ethics of drinking alcohol, see comments on 1 Timothy 5:23). Contextualization. It’s appropriate to limit our freedoms for the purpose of reaching others with the gospel. Paul wrote, “To the Jews I became as a Jew, so that I might win Jews; to those who are under the Law, as under the Law though not being myself under the Law, so that I might win those who are under the Law” (1 Cor. 9:20). If a Christian was sharing his faith with a Hindu person, it would be fully appropriate to refrain from eating a juicy cheeseburger in front of them, because Hindus view cows as sacred animals. This limitation wouldn’t be legalistic; it would be loving. Walking Christians should agree to certain ethical standards. All social groups have limits. If a person was a member of Greenpeace, she would be asked to leave if she started to believe and teach that Global Warming was a hoax. The Christian community is no different in this regard—even if it is different in the ethical standards it holds. There is nothing in principle legalistic about church discipline (i.e. removal from fellowship). This biblical practice is an appropriate option for serious, ongoing, unrepentant, and commissive moral sin (see comments on 1 Corinthians 5:1-13). Leaders agree to higher ethical standards. Paul includes both commissive and omissive standards for Christian leaders (see Titus 1 and 1 Timothy 3). Leaders agree to higher standards because of the influence of their role. Thus while it would be inappropriate to remove a member for sins of omission, it would be appropriate to step down a leaders for sins of either omission or commission. Optional, special agreement groups. This principle fits under the concept of limitations for leaders—namely, believers can agree to higher commitment if they desire to. Realize that people may intentionally misappropriate the term legalism. In many cases, carnal Christians will misuse the term legalism to protect themselves from any sort of admonishment. It is even common to hear carnal Christians cry “legalism!” in clear moral issues—let alone grey areas. Watch for legalists pushing boundaries. Philosophers speak about “the paradox of heaps.” The paradox centers on the question, “How many grains of sand does it take make a pile of sand?” Two? Three? Ten? It’s hard to say. By adding one grain of sand at a time, we can’t really tell when a pile has formed. But after several thousand grains of sand, we certainly have a pile. In a similar way, legalists leverage this paradox to justify sin. They make a habit of questioning where we cross the line into sin—constantly pressing the boundaries. Instead of being governed by the “law of love,” they blur boundaries for selfish gain. Encourage debate, rather than dogma. We should encourage persuasion, rather than coercion, when it comes to following Christ. Rather than making arbitrary absolutes, believers should explain and argue ethical principles and call on people to be unapologetically committed to Christ. Rather than falling into the trap of arguing ethical minutiae, we should stick to the clear principles of Scripture. Ask (and receive) good questions. Legalists are often offended when fellow Christians question their lifestyle. When we are truly under grace, we should be willing and happy to have others speaking into our lives. Do we give others the green light to question areas in our lives which are subjective? Or are we offended when fellow believers question grey areas? What is the difference between Righteous and Unrighteous Judgment? Jesus said, “Do not judge according to appearance, but judge with righteous judgment” (Jn. 7:24). Based on the objective moral imperatives of Scripture. Based on the subjective standards of relative comparison and performance. Intended to bring people to the truth of what God says. Intended to elevate the righteousness of the person who is admonishing the person in sin. Focuses on the external actions of a believer that can be judged as either right or wrong (e.g. adultery, murder, etc.). Focuses on the internal motives of a believer, which only God can truly judge (Jer. 17:9-10; 1 Cor. 4:3-5). Takes into consideration the relative backgrounds and difficulties of others (e.g. the poor, handicapped, disadvantaged, etc.). Judges others’ performance based the opportunities afforded to the individual judging (e.g. “I can do it… Why can’t they?”). Leads to seeking counsel and trying to help the person. Leads to gossip and contempt for the person.